You can quickly define and enforce which applications users are allowed to run both inside and outside your organization, and you can closely track and report on which applications are run by whom, and for how long. 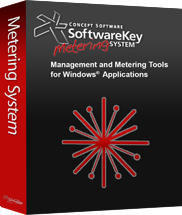 ​With the SoftwareKey Metering System, you know that only authorized and licensed users can use desktop applications, regardless of where they are run. ​The application logs and reports help you make smarter software purchases in the future. Administrators can review collected data and determine who needs upgrades. ​Furthermore, you can determine whether you are in compliance with your software licenses and have a clear record of compliance. The data collection will show which programs are in greater demand than others, helping you clarify the need for additional licenses and when you need to cancel others. This information saves you money by avoiding unnecessary purchases. We looked at many suppliers of software management and metering solutions, and we're thrilled that SoftwareKey, with their robust, functionally rich, and proven solution stepped up and were willing and able to adapt and integrate their solution to fit into the ThinApp architecture. Instead of offering the SoftwareKey Metering System as a separate product, we have chosen to fold the underlying technology into the SoftwareKey System (Protection PLUS and SOLO Server). Since customers looking for metering solutions often have ​unique requirements, we invite you to contact us for a free 1 on 1 consultation.